This easy Pressure Cooker Corned Beef Cabbage Irish Stew combines two classic favorites in a cheesy broth! Disclosure: This post is sponsored by ALDI USA. All opinions are our own. With Saint Patrick’s day coming up this weekend, we are up to our knees in cabbages and potatoes. 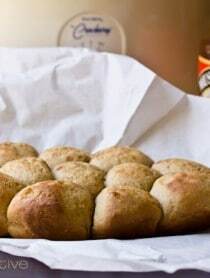 I’ve been cooking all sorts of authentic Irish, and Irish-inspired, dishes like Sweet Irish Soda Bread, Baileys Irish Cream Jello Shots, Pub Cheese, Irish Potato Pie, and Boxties with Whiskey Gravy. 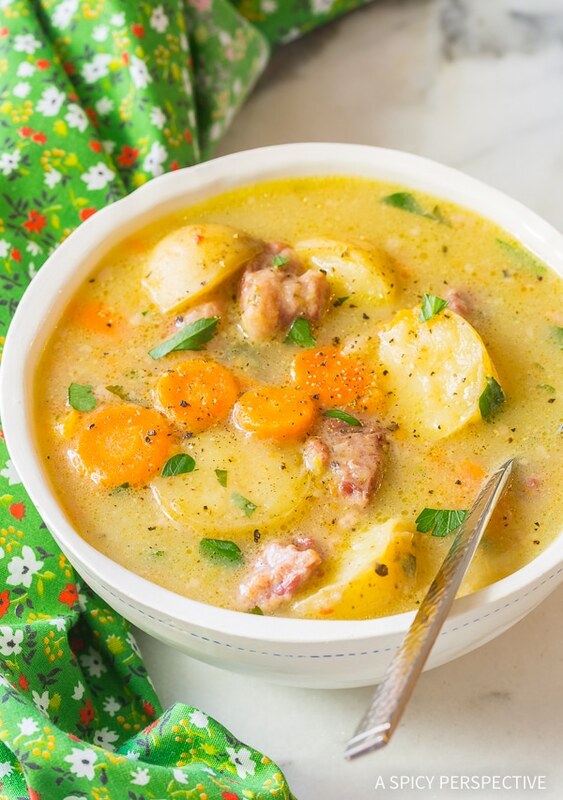 However, I’m really excited to share this easy Irish mash-up recipe with you today! I’m crazy over corned beef hash and corned beef sandwiches. I’ve even had corned beef pizza and egg rolls before that were both truly spectacular. My detachment to traditional corn beef and cabbage comes from the fact that most people over cook their beef, leaving the texture dry and grassy in texture. Therefore this year I decided to make a not-so-authentic dish, combining the best attributes of both Corned Beef and Cabbage, and traditional Irish Stew. Plus, I made it in an electric pressure cooker (Instant Pot) for speed and easy clean up! 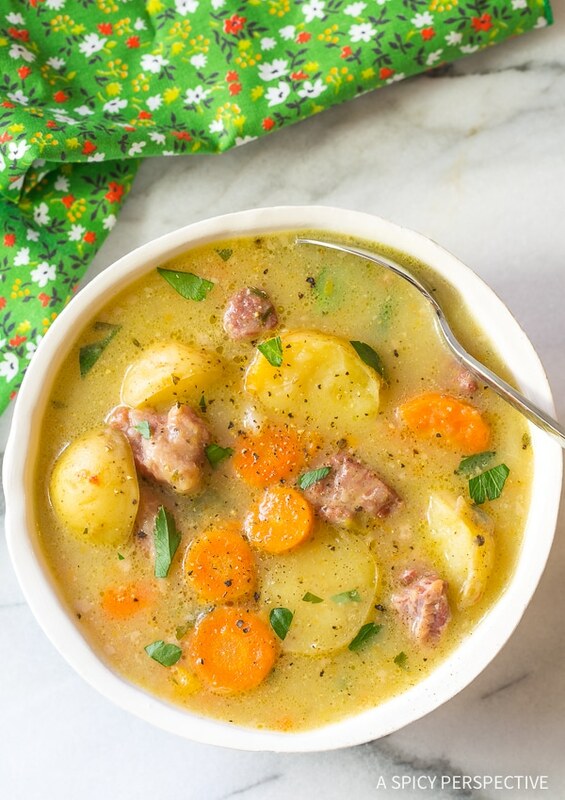 This Pressure Cooker Corned Beef Cabbage Irish Stew recipe is simple to make and has all the elements we love to enjoy on Saint Paddie’s Day… Corned beef, potatoes, carrots, cabbage, and a swirl of cheese to thicken and flavor the broth. Because the corned beef is cooked in the broth and served in the broth, is stays ultra moist. So tender in fact, that it nearly melts in your mouth! It’s easy to over do it around the holidays and wear yourself out, trying to make the perfect meal. 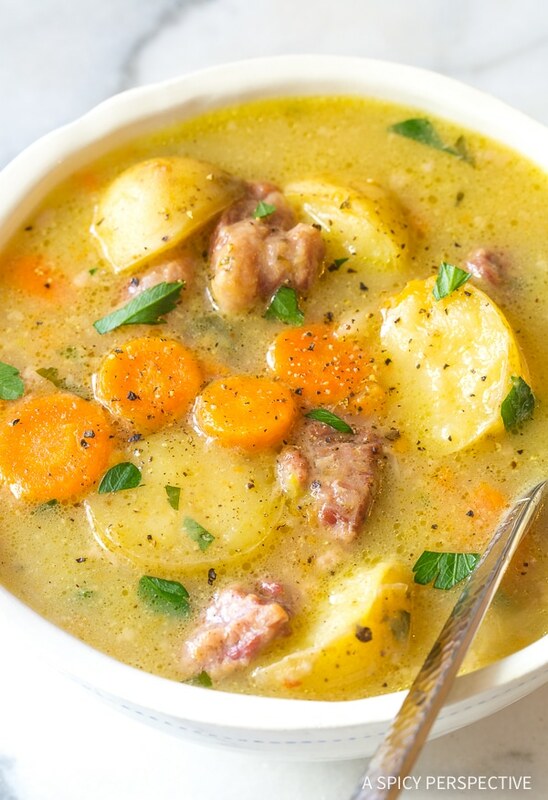 This Saint Patrick’s Day, simplify by making one soup that has it all. If you pair this Pressure Cooker Corned Beef Cabbage Irish Stew with a loaf of Irish bread and a stout beer, you have a meal all your friends will adore. Best of all, you’ll get to celebrate with them, instead of fussing over an elaborate meal while everyone else is having a good time. By the way, I found the ingredients for my Pressure Cooker Corned Beef Cabbage Irish Stew recipe at ALDI. ALDI offers fabulous savings to make even your most decadent celebration meals budget-friendly. They do this by streamlining their stores as to not overspend on unnecessary employees, and by developing their own products to cut out the middle man. This savings is passed onto us! PS, my family can vouch that all the ALDI exclusive brands we’ve tried taste as good (or better) than their competitors, without added chemicals and synthetic ingredients. Last week on our ALDI shopping trip, my son Carson told me that when he moves out of the house he is going to do all his shopping at ALDI so he can afford a really nice car. LOL!! 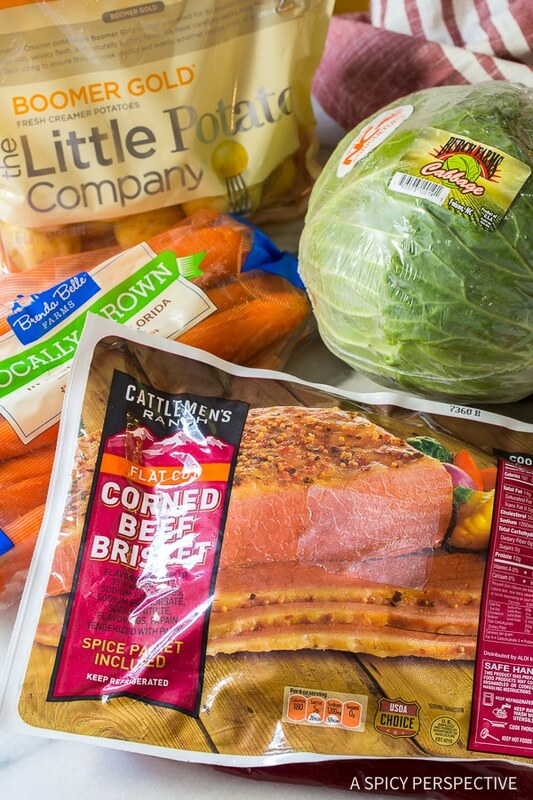 Ready to Make Pressure Cooker Corned Beef Cabbage Irish Stew? 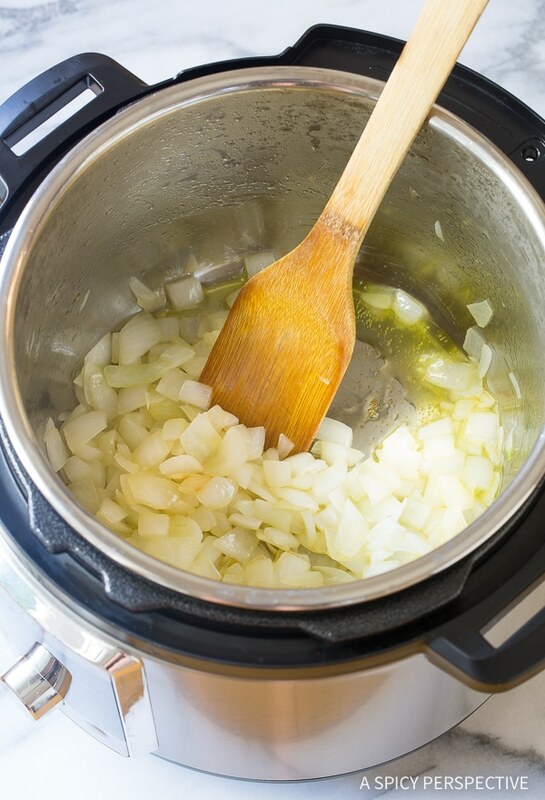 Start by sautéing onions in an electric pressure cooker. Trim the corned beef and cut it into cubes. Then brown the corned beef in the same pot. Top the corned beef with mini golden potatoes, carrots, roughly chopped cabbage, thyme and water. Pressure cook the soup for 30 minutes to soften the meat, cook the veggies, and create a rich rustic broth. Then stir in some shredded Dubliner cheese to thicken the broth. Heaven in a bowl! Learn more about the ALDI way of shopping at ALDI.US. Also, share your #ALDILove experience in the comments below, or on social media. Pressure Cooker Corned Beef Cabbage Irish Stew - An Instant Pot recipe combining Classic Corned Beef and Cabbage and Irish Stew in a rich cheesy broth! Trim the fat off the corned beef. Then cut the beef into 1-inch chunks. Chop all the vegetables. Place the butter (or oil) in the base of an electric pressure cooker and set on Sauté. Add the chopped onions, and soften for 2-3 minutes. 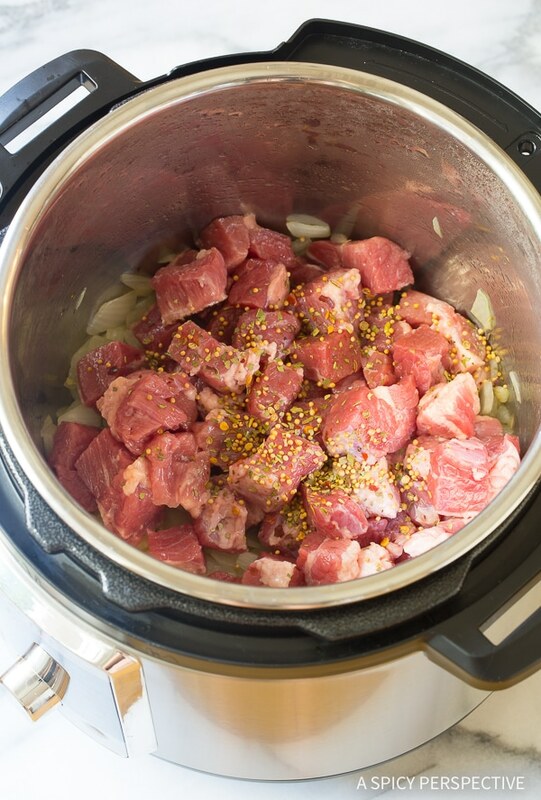 Then add the corned beef chunks and the included seasoning packet to the pot. Brown the meat for 3-5 minutes. Add the potatoes, carrots, cabbage, thyme, and water to the pot. Lock the lid into place, and set on Pressure Cook High for 30 minutes. Meanwhile, shred the Dubliner cheese and toss it with the cornstarch, and set aside. Turn off the pressure cooker, and perform a Quick Release. Once the steam valve button drops, you can safely remove the lid. 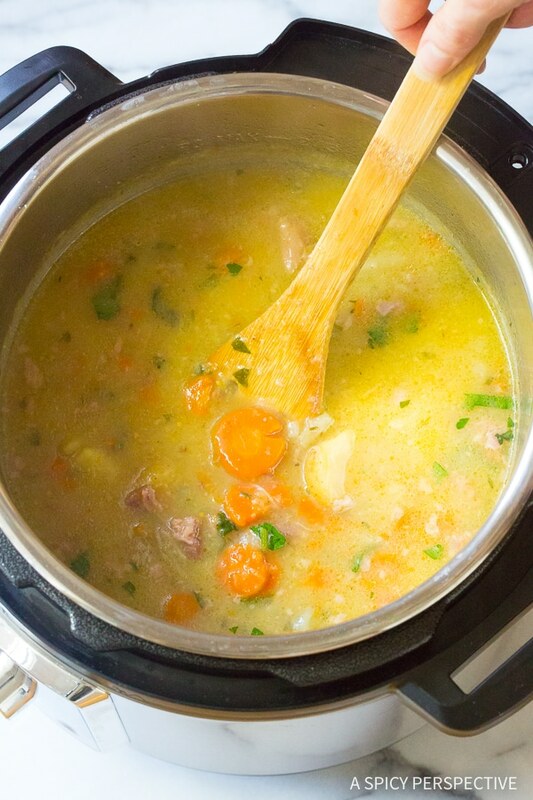 If you didn't trim the fat well enough, there could be a thin layer of fat on the top of the soup. If needed, skim off the fat with a large spoon. Turn the pressure cooker back on Sauté and stir in the cheese. Once the cheese has melted and the broth thickens, taste, then salt and pepper as needed. NOTES: Brand names listed all come from ALDI. Corned beef was on sale so decided to try this. It wasn’t a hit at my house. The saltiness was overpowering. I called it “Reuben soup” and managed to get everyone in the family to eat one small bowl so all of it wouldn’t be wasted, but my 13 year old said “this is saltier than the Dead Sea.” I did not add any additional salt. Dang, this looks delicious! 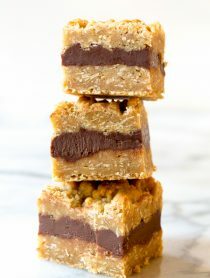 I’m definitely going to be making this very soon! WOW! That is a lot of sodium! I’m guessing the sodium is coming from the meat preservative, cheese, and added salt? If i purchase fresh meat from a farm or butcher, should be less sodium, right? Also, i am dairy intolerant. will have see if i can find a suitable dairy-free match. Hopefully it will be lower in sodium, too..not gonna hold my breath. LOL. Hello and thank you for sharing this recipe> But does the corned beef have to be flat? Why Corned beef flat? Can any of the cut corned beef be used? 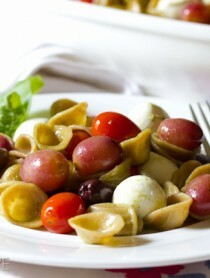 Mr. Weatherman says another winter weekend is on our way so this makes perfect lunch for us ! Thank you so much ! Sounds great. Can you do this in a slow cooker? Thank you! Yes, it just needs to cook long and low. Maybe up to 10 hours.